This is a stunning two bedroom apartment located within the Eagle Point building, boasting two bathrooms, an open-plan reception room and private south-facing balcony with far-reaching views. Eagle Point is located close to the wealth of amenities which can be found in Shoreditch, Brick Lane and Old Street. Spitalfields Market is also within easy reach. Best steak restaurant around. So tasty and very reasonably priced! 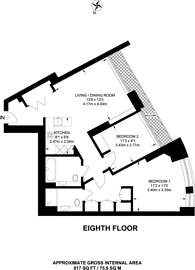 817 (75 Sq M) approx.